Probation officers have been ordered to consider the appropriateness of Community Service for a teenager who was “extremely disrespectful” towards his mother during a disorderly outburst in Carnhill in February. District Judge Barney McElholm ordered that a Pre-Sentence Report be prepared in the case of Ethan Irvine (18), who appeared before Derry Magistrate’s Court on Friday. Irvine had pleaded guilty to using disorderly behaviour in the estate in the early hours of February 25. 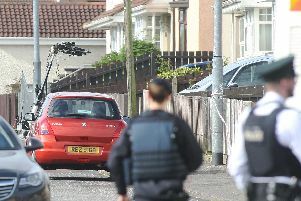 A Public Prosecution Service (PPS) solicitor said police responded to a report of a disturbance in Carnhill at approximately 2.30am on the morning in question and upon arrival officers found Irvine outside an address shouting at his mother who was inside. Irvine continued shouting abusively at his mother despite being warned by police about his behaviour, the court was told. The PPS solicitor said Irvine replied “fine, arrest me” when he was eventually arrested for disorderly behaviour by the attendant officers. District Judge McElholm, however, said Irvine had been “extremely disrespectful” and had used “awful language towards your own mother”. He ordered a pre-sentence report to be completed prior to sentencing on May 19.